As a parent, you never want to see your child mistreated by his (or her) friends. When you see your child being teased, excluded or taken for granted, your natural reaction may be to encourage him to make new friends who will appreciate and care about him. But when you do that, you might find your suggestion shot down by a response that’s all too common for kids in middle and high school: all the good friends are taken. This might seem like a strange thing to say, but it’s a perception that a lot of kids share, especially those who struggle socially. For these kids, it’s tough to build up the confidence to approach new friends, because they’ve already convinced themselves that nobody would like a new friend. They may also believe that all the other friend groups are complete, and there’s no room for them in a new group. With some groups that can certainly be the case. But with a lot of others, it’s more about your child’s perception than reality. 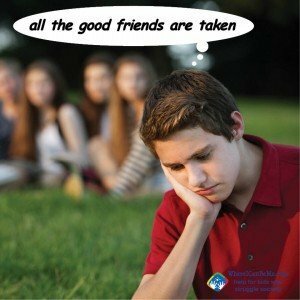 He may think that if others aren’t seeking him out, they would never want him as a friend. This kind of thinking can have a negative impact on a child’s social life, and over time, it can lead to isolation and loneliness. 1. What do you want in a friend? If your child doesn’t know the answer to that question, his search for new friends is just a shot in the dark. It’s important for him to understand that it’s okay to have expectations, and they should serve as a guide for the type of people he surrounds himself with. Once he’s got a few ideas about the traits of a good friend, you can talk about people he’s met outside his current friend group that seem to have those traits. Maybe it’s a classmate, or a teammate, or someone he knows from the school bus. These people won’t necessarily become his new best friends, but it would be worth your child getting to know them a little better. 2. What do you have to offer? This question is key for helping a child build the confidence he needs to approach new friends. It will also help him begin to overcome the idea that other groups are “complete” and have no reason to want anyone else joining in. Help your child think of his strengths, his talents, and the qualities that make him a true friend. The more clear his picture of what he brings to the table, the easier it will be for him to picture himself being welcomed into a new group. 3. What’s holding you back? While some of your child’s fears about making new friends can be all in his mind, it’s important to remember that middle schools and high schools often have their own sets of social rules. These are rules your child knows better than you do. That’s why it’s a good idea to talk about what issues your child has faced at school. Has he been bullied? Did he get stuck with an unwanted reputation? Finding out the factors that are keeping your child from confidently approaching potential friends is the first step to helping him overcome it. That may be something he can work on with you, or you may want the help of a professional or a good social skills program. Either way, your child will need to address what is holding him back if he wants to be welcomed into a new group of friends. All children deserve to have good friendships, even if they’ve fallen into the habit of expecting less. Helping your child consider what he has to offer and what he should strive for in relationships is crucial for giving him the confidence he needs to branch out from his current friend group. If you think your child still needs a little more help learning to make and keep new friends, you may want to consider checking out a good social skills group to help him develop the skills and confidence he needs to form positive relationships. Remember, every child has something to offer as a friend, and no child should feel like they are “stuck” in a group, where they aren’t appreciated for who they are.